We lose sleep for all kinds of reasons: stress, diet, apnea, and… nightmares? Yes, bad dreams can cost us important shuteye. Yet surprisingly, they also may deliver some benefits. Here, we consider what causes nightmares and how they affect us. Nightmares begin occurring in most people before the age of 10. They’re normal unless they significantly interfere with sleep, development, or psychosocial development. 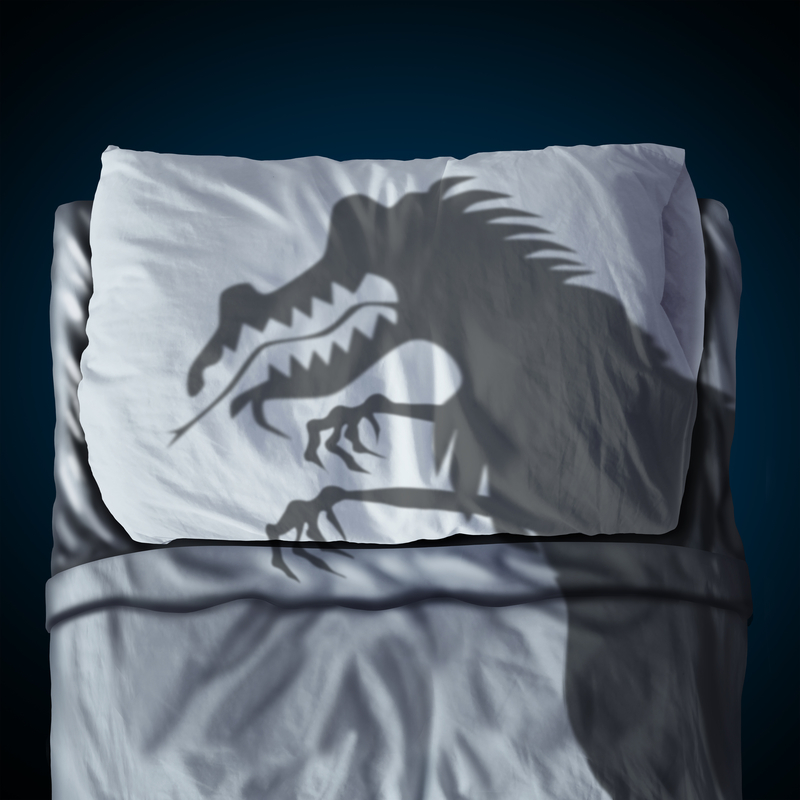 What causes nightmares? Triggers are often correctable—especially in the cases of pre-bedtime eating habits and medications. Nightmares are unique to each of us, they’re personal, and they’re so fleeting that we often don’t remember much about them. And there are any number of factors that trigger them. What causes nightmares for you, however, may not have the slightest effect on anyone else. While nightmares can be disturbing for a child, they’re a normal part of our development. And we don’t necessarily outgrow them. According to Sleep.org, some 50 percent of adults experience nightmares. Anxiety and stress: Worried about work? Stressing about a relationship? Such common issues can manifest themselves in sleep-depriving nightmares. Depression: Mood issues related to such life changes as divorce or break-up, death of a loved one, financial woes, and career concerns can lead to nightmares in some of us. Eating before bedtime. That late snack increases metabolism, causing the brain to become more active, leading to more dream time. And a study published by International Journal of Psychophysiology reported that spicy food and junk food (candy bars, ice cream, and other sugary treats) trigger more brainwaves. A study published in The Journal of The Mind and Body showed that seven of 10 participants had nightmares after eating junk food just before bedtime. Lack of sleep: Overtired from sleeplessness? That very condition could cause even more sleeplessness in the form of disturbing nightmares—a vicious circle. Sleep disorders: Restless leg syndrome, twitching while sleeping, sleep apnea—all of these types of conditions can bring on nightmares. Medications: Some prescriptions (antidepressants, for example) affect brain chemicals, so nightmares you’ve been having could be related to medications you’re on. Withdrawal: Giving up medications (including sleeping pills and antidepressants) or substances (including alcohol) also can result in nightmares. If you’re worried that nightmares are a warning of some sort, relax. Don’t take them literally. In nightmares, we feel like we have no control over the imaginary scenes that are playing out, but they’re just that: imaginary. However, they do often reflect fears or obsessions. Fortunately, nightmare disorder is rare. However, there’s no doubt that recurring nightmares also may cause fatigue. We may have difficulty falling back asleep after nightmares because of their disturbing nature. In a classic domino effect, the fatigue can carry over into our work performance and/or interfere with family or social life. But there’s a flip side: Research also shows that bad dreams actually may be helpful in getting us to move beyond a traumatic event. Nightmares can serve as an emotional release from anxiety that may be weighing on our minds; in fact, they’re normal reactions to stress we’ve been experiencing. “We think nightmares are so common that they have some purpose to process stressors,” Anne Germain, director of the Sleep and Chronobiology Center at the University of Pittsburgh, told CNN in 2017. Being haunted even by traumatic events may be helpful, research shows, and experts think they could actually be beneficial. “Nightmares in the first few weeks after a traumatic event have not been associated with health problems,” reported CNN’s Carinna Storrs. One study illustrates that more than 20 percent of women who were victims of sexual or physical assault were experiencing nightmares about the event three months later. Another study shows that survivors of serious car and motorcycle accidents also were having nightmares months later. alcohol, antidepressants, anxiety, anxiety and stress, apnea, blood sugar, blood sugar symptoms, brain, brain chemicals, children, depression, fear anxiety, food, health, health problems, hypnagogic, hypnagogic hallucinations, lack of sleep, low blood sugar, low blood sugar symptoms, metabolism, mood, night sweats, report, restless leg syndrome, sleep, sleep apnea, sleep disorders, sleep medicine, sleeping pills, stress, sugar, twitching while sleeping, what are night terrors, what causes nightmares.